The Center for Peace and Security Studies (cPASS), located at the University of California, San Diego (UCSD), conducts rigorous, data-driven research on international affairs and U.S. foreign policy. The focus at cPASS is on new and emerging modes of interstate conflict. We are especially interested in how a more diverse set of actors and capabilities is likely to impact conditions of war and peace. Research at cPASS answers questions in a variety of areas by applying innovative thinking and diverse methodologies (experiments, deductive modeling, statistical analysis, case studies, “big data”) to traditional security issues made more dynamic and difficult by increased complexity. We emphasize a team-based, multi-method approach to research that combines qualitative and quantitative perspectives; the strongest insights come from integrative approaches. Security challenges facing the broad coalition of status quo powers have begun to emerge from a period of unprecedented stability. These new challenges have created a complex environment in which decision makers increasingly struggle to formulate effective policy. Uncertainty may be one of the most difficult and vexing features of this new era, as policy makers are tempted to take military action, even when restraint may be optimal. Similarly, deterrence, which has been the bedrock of U.S. strategy in the post-World War II period, may be underappreciated, over-utilized or misapplied in an era where past successes have led to the innovation of new modes of conflict sponsored by “near peer competitors” and others. Past practice is germane but also incomplete. Officials have come to recognize the need for evidence-based research leveraging best practices and novel theory to deal with complexity and an evolving set of unknowns. Funding for cutting-edge research on national security has therefore increased. At the same time, there is little support or underwriting for basic research in the social sciences. The University of California has embraced an entrepreneurial model for critical research infrastructure at precisely the moment that small investments promise to lead to major dividends in external support and the cumulation of knowledge. A sustained effort to inform national security and our collective understanding of international affairs requires that we leverage the skills and dedication of a uniquely capable staff. Integrating traditional and emerging research techniques into innovative and successful team-based externally-funded research on national security is problematic given the smaller scale of such efforts and the lack of established administrative support and staff for these activities. We plan to leverage start-up funding from several sources to capitalize on a confluence of the Center’s capabilities and the needs and opportunities for serious multi-method/multi-disciplinary security research. Recognizing the need to develop and sustain a research team with a diverse set of skills and backgrounds to pursue new initiatives for externally-funded research in the area of national and international security, the Vice Chancellor for Research at UCSD granted Dr. Gartzke permission to establish the Center for Peace and Security Studies in April 2016. Figure: Combined human and automated reading of crisis narratives map every single step taken by each state as each crisis unfolds (e.g. the Cuban Missile Crisis). If history is to be a guide for understanding the future of international conflict, we need both a comprehensive library of past examples to draw from and methods for determining which of those examples are analogous to a current crisis or question at hand. These are the goals of data driven approaches to international conflict. At cPASS, and in particular the Machine Learning for Social Science Lab (MSSL), we are systematically cataloging the full history of international peace and conflict. We are organizing our efforts around five key measurement areas: (1) who are the players in the international system over time; (2) what military, economic, or political means do they have to interact with one another; (3) what are the main logistical constraints they face imposed by geography or infrastructure that restricts their ability to act on each other; (4) what are the actions that actors can take toward one another and how are those actions organized into larger sequences of moves and countermoves; and (5) how do those sequences of moves and countermoves map into larger outcomes of peace, war, prosperity, independence, or subjugation. Figure: Game tree representing the decisions two adversaries make on the road to peaceful settlements, all out war, or some amount of hassling short of war (e.g. grey scale conflict). 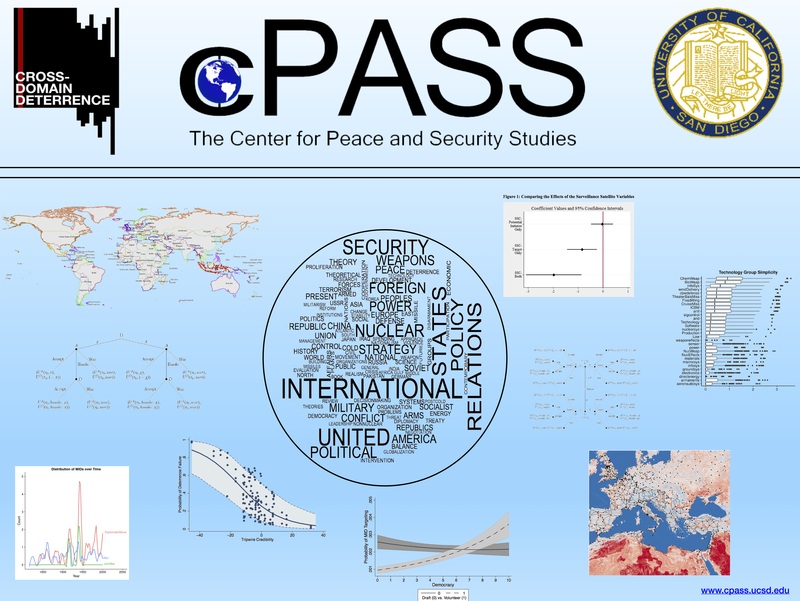 cPASS has a group of researchers who specialize in unique theoretical models and empirical strategies for the study of economic interdependence, conventional deterrence, nuclear proliferation and alliances as well as for testing informational theories of war. cPASS uses game theory which is the use mathematical modeling to define the structure of interactions between multiple actors as a means to better understand the strategic choices these actors make. Game theory is useful because it provides an elegant framework for considering one actor’s decisions in the context of how all other actors respond to the decision. Specifically, the equilibria of game theory models are the sets of strategies where each actor selects their best response to the actions of every other actor; these strategies constitute an “equilibria” because no actor has incentive to alter their behavior as they are all selecting their best responses. In the social sciences, game theoretic modelling has been applied broadly and has been used to describe the behavior of firms, the fundamentals of nuclear deterrence theory, the conditions where international cooperation is possible, why war occurs, arms races, and other political, economic, or sociological phenomena. The formal theory component of cPASS will examine the choices that state and non-state actors make regarding military force. We seek to better understand how actors arm, deter, fight, and make peace in complex strategic environments. Three open questions we seek to address are: (1) how new technologies (like cyber capabilities) alter state’s military investment decisions, (2) how different technologies factor into a state’s decision to declare war, and (3) what structural factors lead to grey zone conflict rather than large-scale conventional war.